211 Bernard: Wednesday September 14th : Graphic Novel Book Club - Sam Alden's New Construction: Two More Stories. 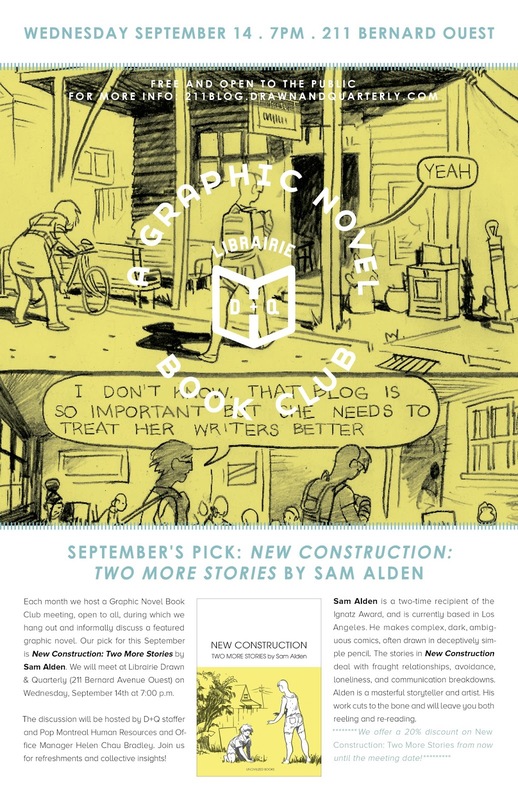 Wednesday September 14th : Graphic Novel Book Club - Sam Alden's New Construction: Two More Stories. Each month we host a Graphic Novel Book Club meeting, open to all, during which we hang out and informally discuss a featured graphic novel. Our pick for September is Sam Alden's New Construction: Two More Stories. We will meet at Librairie Drawn & Quarterly (211 Bernard O) on Wednesday, September 14th at 7:00 p.m. The discussion will be hosted by D+Q staffer Helen Chau Bradley. Join us for refreshments and collective insights! **We offer a 20% discount on New Construction: Two More Stories from now until the meeting date. Sam Alden is a two-time recipient of the Ignatz Award, currently based in Los Angeles. He makes complex, dark, ambiguous comics, often drawn in deceptively simple pencil. The stories in New Construction deal with fraught relationships, avoidance, loneliness, and communication breakdowns. Alden is a masterful storyteller and artist. His work cuts to the bone and will leave you both reeling and re-reading.